« Organ Pipe’s Humane Borders — But Are they Too Humane? ©Bert Gildart: Though an estimate 60 percent of Organ Pipe National Cactus National Monument is closed (see previous post) several absolutely gorgeous areas remain open. One such area is the 21-mile long Ajo Mountain loop Drive, which in turn offers access to several world-class hiking trails. Yesterday, Don and Nancy Dennis and I made the drive and then, at about the halfway point, embarked on a somewhat arduous climb into Bull Pasture. Before Organ Pipe was declared a national monument in 1937, the area was used by local ranchers as a summer pasture for cattle. Because the pasture is enclosed on several sides by towering mountains, ranchers could control cattle egress. The trail climbed steeply and though it is fall, a number of wildflowers were in bloom to include the brittlebush. 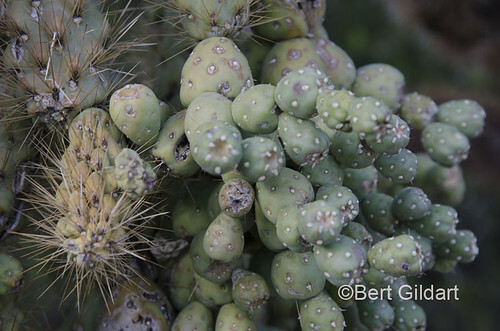 But it was the cactus that generated the most comment, and one of the most conspicuous seemed to be the chain cholla. In places it was so thick that it created an arch over our trail. 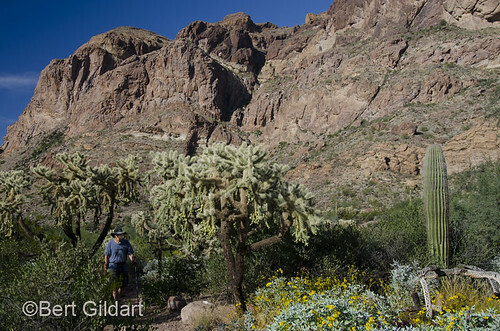 Back dropped by the Ajo Mountains the setting was stunning and I’ve enclosed an image here of Don walking through this forest of Oregon Pipe, Saguaro and chain cholla. The point is that although much of this park is closed, those areas that are open contain some of the most beautiful examples of the Sonora Desert. More people should experience them! This entry was posted on Tuesday, December 4th, 2012 at 2:49 pm and is filed under Natural History/Conservation, Photography, RV Travel, Travel, View Point. You can follow any responses to this entry through the RSS 2.0 feed. You can leave a response, or trackback from your own site.